Fiction – paperback; Peirene; 122 pages; 2017. Translated from the German by Jen Calleja. 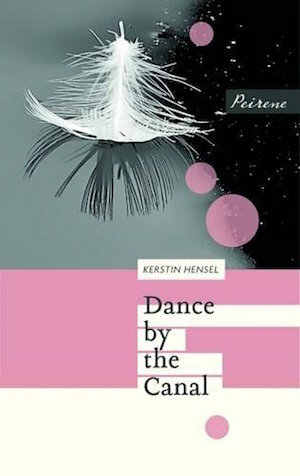 Kerstin Hensel’s Dance by the Canal gives voice to the voiceless: a homeless woman living under a canal bridge in East Germany. First published in 1994 under the German language title Tanz am Kanal, it has recently been translated into English by Jen Calleja and published by independent press Peirene as part of its East and West Series. Now that I am sitting down here by the left pillar of the bridge with this large, smooth sheet of packing paper at my feet, I feel joy for the first time in years. It’s no coincidence that fate has brought me this paper — I’ve been chosen to write. I’ve been put on this earth for no other purpose than to tell the story of my life, and today I will begin. What follows is a narrative that swings between two time periods — Gabriela von Haßlau’s childhood under Communism in East Germany in the 1960s and her current life as a homeless woman intently focused on scribbling her autobiography on scraps of paper salvaged from rubbish bins. From this we learn that Gabriela was the daughter of a vascular surgeon, who rises to become Chief Medical Officer, and a society hostess and that she grew up in Leibnitz, a (fictional) industrial town in East Germany, where her parents were famous for their bourgeois ways and big parties. Schooled with the children of labourers, textile workers and machinists, Gabriela stands out, not least because the “von” in her name indicates she’s a descendent of noble Anhaltinian stock. Yet, whether by accident or design, Gabriela does not really shine and fails to fulfil her educational potential. Despite being taught by one of the country’s leading violinists, Gabriela shows a shocking lack of musical talent and it’s only when her teacher puts her “forceful strange tongue, thrusting and churning between my teeth” that her parents agree she can stop the lessons. She’s only five years old. Later, when her parents separate, Gabriela lives with her father, who becomes increasingly reliant on alchohol. He sinks into a depression, loses his job and falls out of favour with the Communists. It’s all downhill from there. Dance by the Canal paints a convincing (and disturbing) portrait of how an oppressive political system can have long-lasting repercussions on individuals, damaging their psyches and leaving them at the mercy of a rigid, often uncaring society. While Gabriela’s tale is told at an emotional distance in simple, succinct language, there are “muddled” passages which indicate the state of her mind. Her confusion and desire for acceptance as an individual, rather than as a cog in a machine, is heartbreaking. Intense, sobering and dripping with melancholy, this novella leaves a dark impression on the reader. This sounds very powerful. Peirene are so impressive with their publishing choices. It is powerful but it’s got a strange, abrupt ending, which left me a little confused. I plan on reading more Peirene titles this year. I’ve got the entire set (I’m a subscriber) but have only read a third of them. It sounds like, for some East Germans, it’s a case of out of the frying pan and into the fire. Yes, they have their freedom, but they’re poor, hungry and homeless. Yes. And what do you do with that “freedom” when the state has only allowed you one way of living and only given you a rudimentary education and stifled your thinking/individuality?